A distinction is commonly made between room or exhaust air humidity control and supply air humidity control. Which control variants are used depends on the respective installation concept and the task. Room or exhaust air humidity control is preferable for use in air conditioners. The control sensor here is placed in the room itself or in the air exhaust duct. The large distance between steam distributor and humidity sensor normallyensures that the air mixes well. The controlled system in this type of humidity control is characterized by its large storage mass, and it simplifies a stable control mode. Supply air humidity control is used where this is necessary for system engineering reasons. This includes, for example, central humidification with subsequent zone branching which must be rehumidified individually. 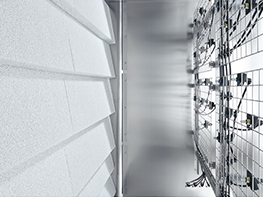 Even room or exhaust air humidity controls can have the control engineering properties of a supply air humidity control if the room volume is very small or air exchange rates are very high. In this type of control, the control sensor is placed in the air supply duct downstream of the steam distributor. Due to the low storage mass between steam distributor and humidity sensor, the rating of the controlled system is usually high. The selection of the suitable control system for a certain application depends on the controlled system, permissible control tolerance, humidity increase and supply air temperature. Apart from the rating of the humidity-controlled system, the selected control equipment as well as the control parameter setting, the control quality of a humidity control loop is also greatly affected by the humidifier itself. Over-dimensioned humidifier capacities can have unfavorable control characteristics in the bottom partialload range. 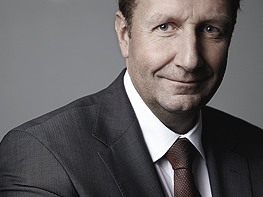 In this case, it must be ensured that continuous output control is also possible in the bottom partial-load range. A distinction is made in humidification between "isothermal" humidification (steam) and "adiabatic" humidification (atomization, evaporation). Although steam humidification, strictly speaking, is not exactly an isothermal change of condition, the minor warming of air that occurs is disregarded when considering control principles. On the other hand, a noticeable temperature drop occurs in adiabatic humidification. This must be balanced by suitable damper registers and therefore is also taken into account in the selected control strategy. 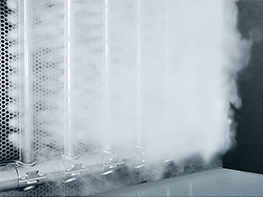 Steam humidification is usually characterized as isothermal. The fact that it is not exactly an isothermal process in the thermodynamic sense has already been pointed out. A minor temperature increase (F value 0.12 k/g steam) occurs due to the addition of steam to the system air. This low value is usually disregarded. However, note that the steam distributor's heat emission can also heat the system air. The extent of this heating depends on the selected steam distribution system and, if applicable, must be taken into account when planning the system. The humidification distance has special significance in steam humidification. The water vapor coming from the steam distribution pipes first of all condenses in the air current and is visible as mist over a certain distance (humidification distance). This is followed by the expansion and mixing zone where uniform mixing of the system air takes place with the injected volume of steam. This circumstance alone must be taken into account when sizing humidification distances for a hygienic operating mode. 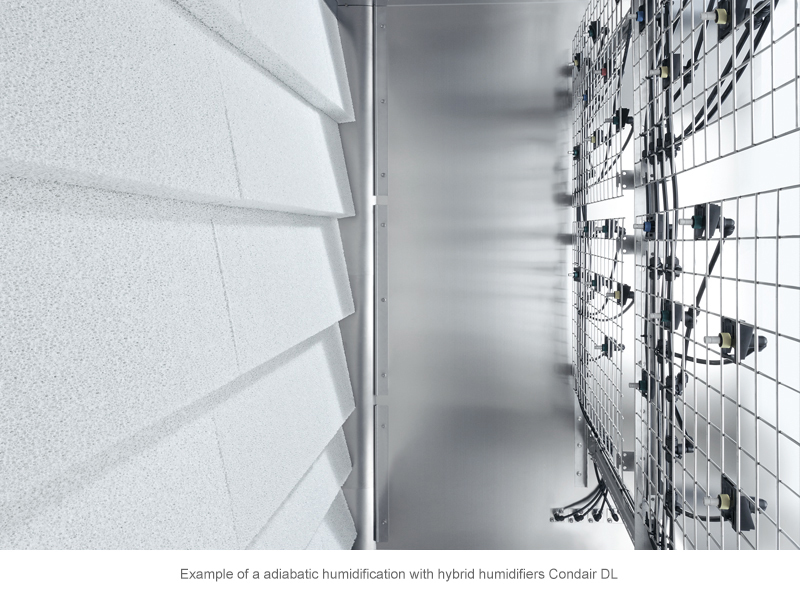 Optimal control results depend on optimal humidity distribution in the mounting location of the sensing elements. 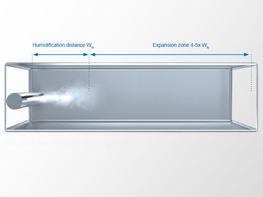 The humidification distance depends on different factors and forms the basis for establishing the required minimum distances to downstream system parts and sensing elements. Please consult qualified equipment manufacturers for reliable information about the length of humidification distances and the required minimum distances. 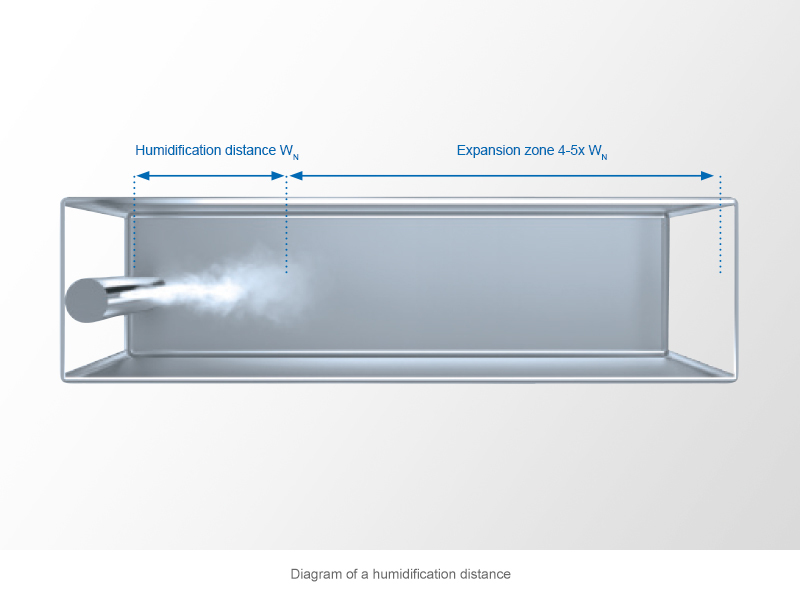 How the Humidification Distance can be shortened? To some extent, condensation is aided by the contact of the water vapor with the cooler system air. However, the main reason for condensation is the unfavorable distribution of the steam through the duct cross-section along a steam distribution pipe. The required humidification distances are not available in retrofits in particular. In these cases, the use of multiple steam distribution systems often leads to success. Homogeneous distribution of the water vapor can occur as much as possible on the entire air current at appropriately short humidification distances. A useful scale for evaluating steam distribution is the homogeneity index which can be easily determined. Adiabatic humidification technologies basically offer the possibility of room/exhaust air humidity control and supply air humidity control. Due to the ensuing temperature drop because of the removal of the heat of evaporation from the system air, humidity control can only be carried out in conjunction with temperature control. The conventional control procedures are dew point control or enthalpy control. 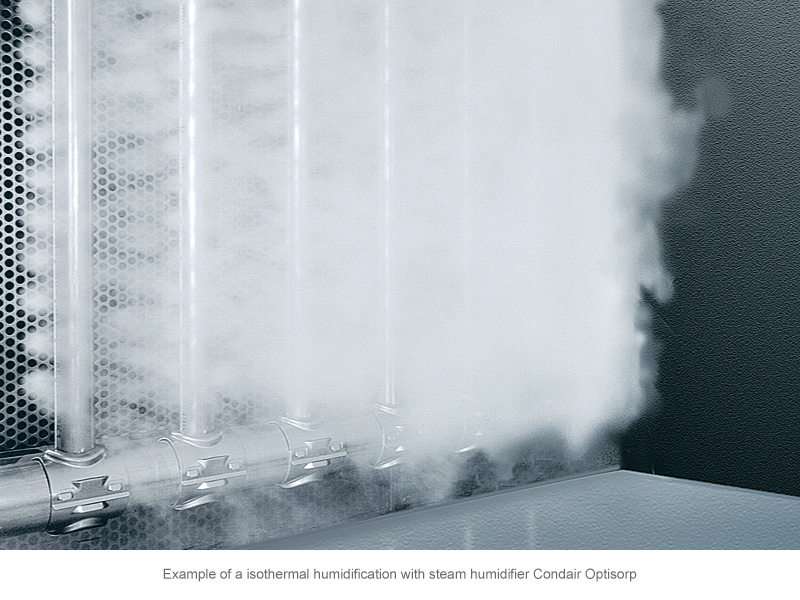 Which procedure gives optimal results mainly depends on the controllability of the humidification system used. The humidification distance in adiabatic humidification systems is often defined by the overall length of the humidifier based on the design. However, if devices that atomize aerosols in the air current are used and these aerosols are incompletely deposited (high-pressure or ultrasonic humidifiers), the humidification distance must also be taken into account here. Regardless of the hygiene issues, the same basic principles described in 2.1.1 apply in this case. However, due to the low energy content of the atomized water, humidification distances longer than those used in steam humidification are used.